Black Coffee and Green Tea: Super Morning Banana Diet! No wonder they're so expensive here. The Morning Banana Diet regime is simple: A banana (or as many as you want) and room temperature water for breakfast; eat anything you like for lunch and dinner (by 8 p.m.). A three o'clock snack is okay, but no desserts after meals, and you have to go to bed before midnight. Sumiko Watanabe, a pharmacist in Osaka designed this stress-free diet to help increase the metabolism of her husband Hitoshi Watanabe, who had been rather overweight. In due course, Mr. Watanabe lost 37 pounds and introduced the diet on mixi, one of Japan's largest social networking services. Morning Banana Diet books published since March have sold over 730,000 copies, and some have been translated and published in South Korea and Taiwan. The diet became even more popular after a TV program featured a singer who had lost 15 pounds in just six weeks. It was literally the day after that program aired that the shortage of bananas first became evident. 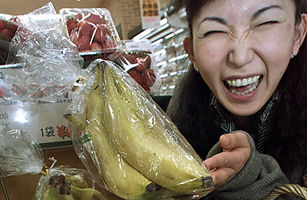 "Bananas suddenly flew off the shelves, there was a 70%-80% increase in weekly sales compared to the same period last year," says Takeshi Ozaki, a spokesperson of Life Corporation that runs 201 supermarkets throughout Japan." Well, at least they didn't pick a food that could go extinct.